The authors who pitched their books. It’s not easy to put your work out there, and you should be proud for participating. The agents and editors who read pitches. We know you have crazy-busy schedules, and truly appreciate that you came by. The supporters of #SFFpit who helped critique pitches, promote the event, or cheer the authors on. We couldn’t have held this event without you. Thank you so much! For the first #SFFpit in June, we had 530 participating authors, as well as 26 literary agents and a handful of small press editors. This year, my official count is 641 authors, 32 literary agents, and 11 editors! In other words, #SFFpit grew by more than 20%. The literary agents alone hit “favorite” around 355 times, bringing sheer delight to 203 different authors. 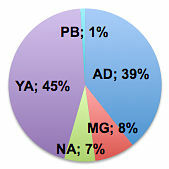 By my count, of the 641 participating authors, 87 (14%) got favorites from two or more literary agents. That really speaks to the creativity and high quality of the pitches yesterday. Congratulations to everyone! As you may know, I love working with big data. 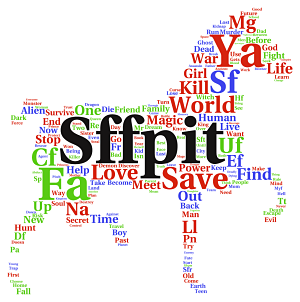 Using the Twitter API, I pulled down all of the #SFFpit tweets and did a bit of analysis. These numbers are based on around 6,000 tweeted pitches that occurred within the contest window. First of all, I wanted to look at the age category distribution. Surprisingly, young adult (YA) dominated the field this year, accounting for 45% of pitches. Adult was the other major category (39%). We had a small but decent turnout of pitches for new adult (7%), middle grade (8%), and picture book (1%) as well. Fantasy edged out science fiction, but it was very close at the high level of genre. In subgenres, however, urban fantasy (UF) and contemporary fantasy (CF) were standouts. The most common sci-fi subgenre was space opera (SO), which is a good thing since many editors and agents are looking for space opera right now after the recent success of Ann Leckie’s Ancillary Justice. Paranormal was still popular, and I was surprised to see a couple hundred pitches for time travel (TT) novels as well. I think that the community aspects of contests like #SFFpit are just as important (if not more important) as the chance to find literary representation. Many of the participants found new friends, followers, and even critique partners through #SFFpit. To help promote that kind of relationship building, I’d offered up a prize to the participant who retweeted the most pitches: a copy of Ben Bova’s wonderful book The Craft of Writing Science Fiction That Sells, which is still available from ReAnimus Press. The clear standout winner by RT count was Magali A. Fréchette (@stormowl7), who retweeted 644 pitches yesterday! I’ll be sending her the prize tomorrow. I’d also like to thank some other superstar retweeters: Kathryn Trattner (@k_trattner) and Tabitha Lord (@tlordauthor). Both of them had over 400 retweets, so please reward them by following them on Twitter! If your pitch was favorited yesterday, congratulations! As you probably saw in the feed, writing a unique and compelling pitch is no small feat. Hopefully, the person who favorited your Tweet was an agent high on your list, giving you the perfect excuse to follow the submission guidelines and send your work to him or her. If instead it was an agent not familiar to you, then please do some homework. Ask around. Use resources like QueryTracker to get the scoop, and decide if the agent might be a good fit for you. About a dozen small press editors came to mark favorites yesterday, too. I’d invited some of these — notably the editors from World Weaver Press, Jolly Fish Press, and Medallion Media Group. Others, like Entangled Publishing, I know by reputation. The remainder of editors and presses are not ones with which I’m familiar. In other words, I can’t vouch for them and so I encourage you do some vetting. Look them up on the Absolute Write forums and other sources. Use common sense, and remember that all money in publishing flows to the author (i.e. don’t pay any fees for a “book deal”). Also, you must recognize that this is a different path to publication: small publishers, little or no advance, and generally no agent required. So you’ll need to think about whether that’s what you really want. Be proud of what you’ve done. You’re a pitching author, now! Find other uses for your pitch, such as the #PitchMas event coming up, or the first line of a query letter. Remember that almost all of the agents who were in #SFFpit are open to traditional queries as well. Find their regular querying guidelines and go after them! Thank you again, and I look forward to seeing you back in June 2015! Hey, Dan. Thanks again for organizing the event! It was exciting and, of course, valuable. I don’t know if you can get at this data through Twitter’s firehose, but I’d love to know what categories and genres got the most favorites. Gives an indication of what the agents were seeking/most interested in. Hey, Neicole, good question! I will take a look. when you established the stats for genre/subgenre, that includes all the pitches, right? So if I pitch 24 times with #YA #EF, that’ll show up 24 times in your stats? Thanks for crunching the numbers. It helps to see I’m one of many who didn’t get any favs this time. Mayken, good question. Yes, it includes all of the pitches (even multiply tweeted ones). Presumably, most authors tweeted about 1-2x per hour so there should not be a strong bias. There were so many wonderful pitches during #sffpit yesterday! I loved reading them all and pitching my own. Thanks for hosting the event! You’re welcome, Cindy! Glad you enjoyed it. Thanks again for organizing the event! It was exciting and, of course, valuable. I don’t know if you can get at this data through Twitter’s firehose, but I’d love to know what categories and genres got the most favorites. Gives an indication of what the agents were seeking/most interested in. What a terrific post. Thank you so much. It was a blast.